At EverLine we are committed to delivering quality; to do this we use the highest quality products available. TBL Durables is the best line painting product available and offers numerous advantages over traditional line painting products. 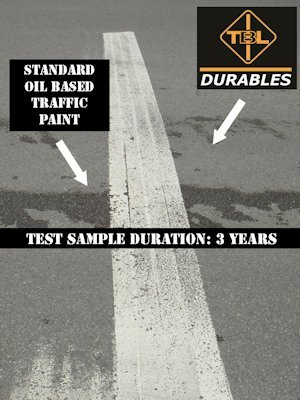 TBL DURABLES© is a revolution in line marking technology. The secret to the success of TBL DURABLES© rests in the name itself – Durable. TBL DURABLES© is a sprayable liquid that cures in 5-10 minutes creating a hard plastic that is more resistant to wear and provides greater reflectivity than any other product on the market. TBL DURABLES© is also the most environmentally friendly product available today; three times cleaner than water-based paint and ten times cleaner than oil-based paint. This makes it the clear choice for property management companies trying to meet environmentally friendly standards. Property managers and business owners realize a 20-30% savings over three years. 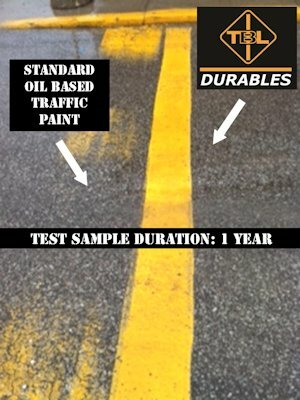 The images below show exactly why TBL DURABLES© is superior to oil based line painting products. The oil based lines on the left are almost completely worn away, while the TBL DURABLES© lines are still completely visible.